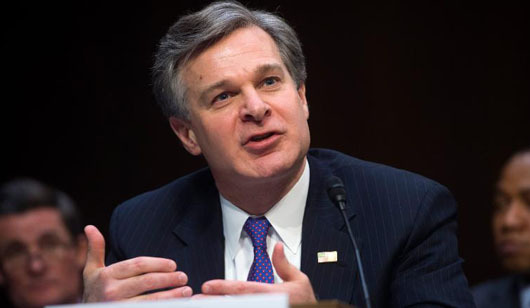 Senate Judiciary Committee Chairman Chuck Grassley demanded FBI Director Christopher Wray explain why the bureau raided the home of a recognized whistleblower who had reportedly provided documents to the Department of Justice related to the Uranium One scandal. The whistleblower, Dennis Cain, reportedly produced documents regarding the FBI’s failure to investigate potential criminal activity regarding former Secretary of State Hillary Clinton, the Clinton Foundation and the Russian company that purchased Uranium One, The Daily Caller reported on Dec. 3. Cain’s lawyer, Michael Socarras, told the Daily Caller that Cain turned the documents over to DOJ Inspector General Michael Horowitz, who subsequently deemed that Cain was covered under the Intelligence Community Whistleblower Protection Act. The FBI on Nov. 19 raided Cain’s private residence in Union Bridge, Maryland. Cain told the special agent leading the raid that he was protected as a whistleblower, but the agent still ordered 15 additional agents to raid Cain’s home, according to Socarras. The agents searched Cain’s home for six hours. Grassley also asked Wray of “the basis” for the raid and to provide a copy of the original warrant and all supporting documents. The court order and all the documents justifying the raid are sealed and not available for public viewing, the Daily Caller noted.